Objective: The load on the tendon fastening can be adjusted with use of tape, so that the maximum load is moved to another part of the tendon fastening allowing the injured part to be relieved. 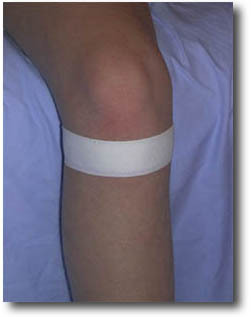 Application: One or two tape “anchors” are applied around the lower leg just below the lower edge of the kneecap. The tape must not be fixed so tightly so as to cause any discomfort from the lower leg or foot (cold sensation, sleeping sensation). nor treatment with the preparation of an individual rehabilitation program.